The Fixtures Fittings and Contents Form in property sales, generally form TA10 Law Society Fittings and Contents Form is one of the essential forms that all sellers must complete. It is sometimes also referred to as a Schedule of Fixtures and Fittings or a Fixtures and Fittings Form. This form states what the seller is including and not including in the sale price. It is important to be aware that it forms part of the contract for sale. 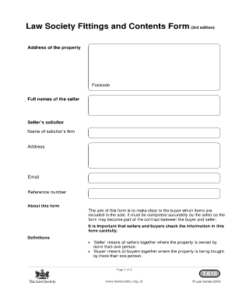 If there are any items you want to sell, you can mark this in the relevant box and give an ‘asking price’. Your purchaser will have to agree to purchase these items for there to be an agreed sale, so it is best to get this agreed direct with your purchaser or via the selling agents. Examples of what may be included in the sale and classed as contents are blinds, curtains and light fittings. Ensure that you have agreed with the seller whether items such as, for example the washing machine and fridge are included. Such items will only be included if actually present in the property at the time of the agreement. For the sake of clarity, vendors and purchasers should list the contents to be included or excluded as specifically as possible to avoid later disagreements. The same goes for any fixtures that the vendor wishes to remove by agreement. Removing a fixture without doing so may then delay settlement or cause the purchaser to claim compensation or retain purchase funds until the item is returned or something is agreed. The fittings and contents list may not include all the items agreed to be sold to the purchaser. If there are a number of items the purchaser has agreed to buy, get a separate inventory of all items agreed with the buyer. This is especially important if the value of these items is significant and does not form part of the purchase price for the property (and therefor stamp duty will not be payable on this amount). Sometimes sellers choose to sell ’sold as seen’, this means what you see is what you get. This is most commonly seen in repossession sales (when the seller is the lender who has taken possession and knows nothing about the property ) or, for example, sales by executors in an estate.In these cases the property may not be in a good condition cosmetically and in fact you may prefer for items such as carpets to be removed rather than to stay. If this is the case, get this agreed with the seller before you exchange contracts. What is the Difference Between Contents, Fixtures and Fittings? Fixtures are things that are attached to the property and pass to the buyer under a sale automatically (although it is still wise to specify it will be so if there are any doubts). A typical fixture will be attached to the land in a permanent way such that removing it would cause noticeable damage. Examples of fixtures include an attached garage, carport, and a bolted down garden shed, attached mantelpiece or bookshelves. Contents (also known as chattels) are things that can be more easily removed and are not necessarily attached to the land. The seller is able to take contents with them, so long as they do not form part of the contents in the sale. The are therefor not included in the sale unless the seller expressly agrees to leave them. But what if an item is attached but also easily removed? There are many items in the grey area and this is where issues commonly arise when the vendor feels entitled to take the item with them but the purchaser argues that they are a fixture and therefore included in the sale. Practical complications occur when buyers move into properties and discover that door handles have been removed, fire places taken out, or sellers find they are subject to a claim for items removed from or a claim for the costs of removal of items that should have been removed. The Fittings and Contents Schedule is designed to avoid these issues by introducing certainty. For further advice on selling your property, please contact our Conveyancing Manager who would be delighted to hear from you, give you a quote and answer any questions your may have, telephone 0191 466 1444, email advice@geoffreylurie.com or contact us here. 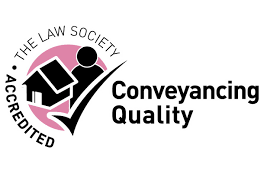 We are accredited by the Law Society of England and Wales under their Conveyancing Quality Scheme seal of approval which provides a recognised quality standard for residential conveyancing. The Conveyancing Quality Scheme gives you complete peace of mind when it comes to home buying. If you would like more information please get in touch with one of our experienced property lawyers.